It was a banner day at the thrift store the other day—even a little party-like, since I went with my friend Laurel. 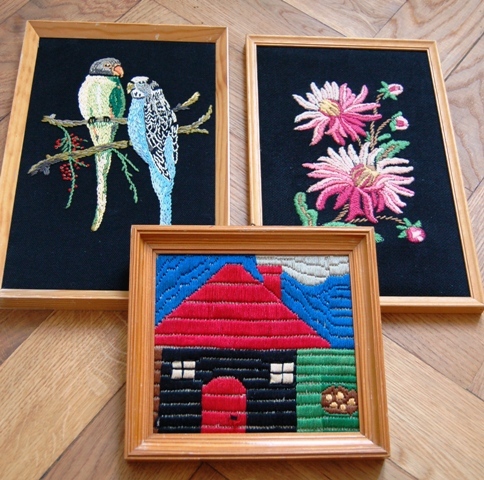 Behold my growing collection of thrift store needlepoint pieces. These are impossible to resist. 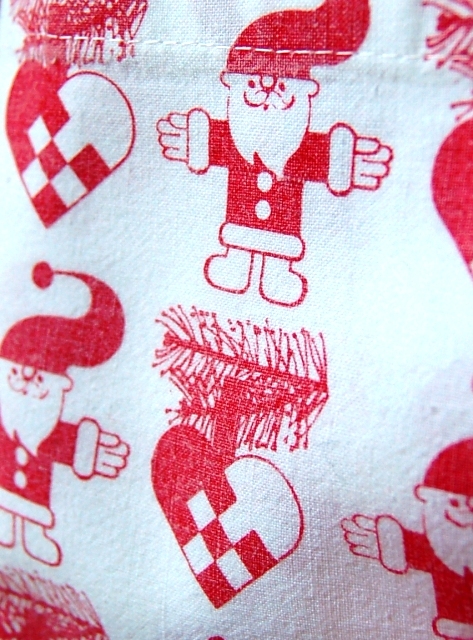 They’re hand-stitched! They’re kitschy! They’re only 1 to 2 euros a piece! I’m not in too much danger of over-collecting since I don’t see them every time I go. But it’s a fine line, I’ll give you that. 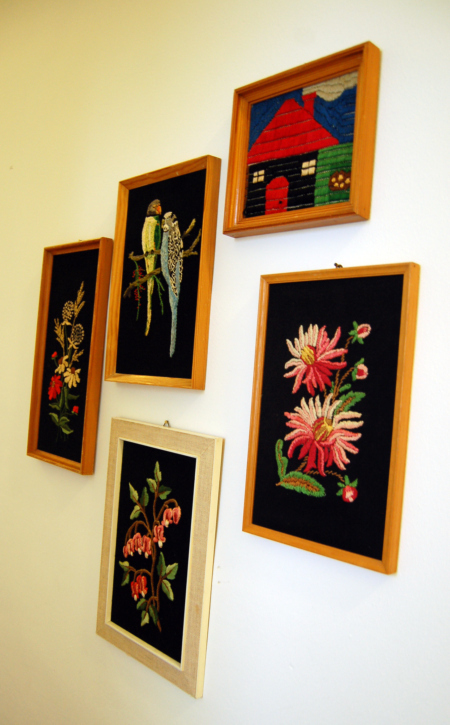 The two latest ones are the one at the bottom with the linen-ish frame and the one on the far left. 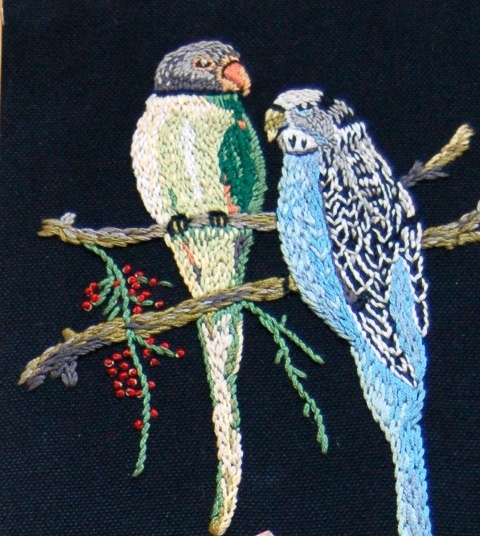 The parrots are still my favorite. The Australopithekus rubber stamp just slays me. What item couldn’t be improved with a little Early Man stampage? 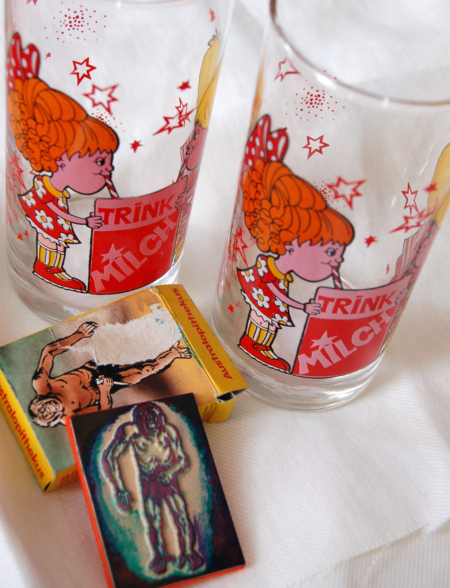 And the trink glasses are pretty rockin’, too. 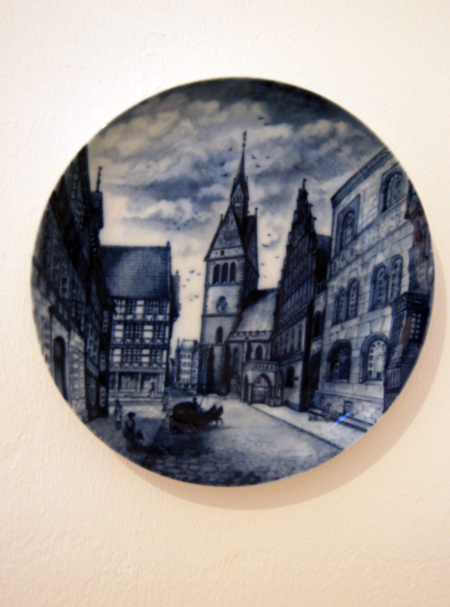 A Hannover plate in blue and white! It was a little steep for the thrift store—8 euros—but totally worth it. It’s a view of the Marktkirche and the Alten Rathaus, in one of the first areas I stopped in Hannover. Definitely a keeper. The weather is warming up around here, and today is actually sunny. So happy about that. I just started reading Cold Comfort Farm. Ever heard of it? It is totally hysterical, and seems so far ahead of its time (published in the 1930s). I can’t quite describe it—I’ll think on a description, but if you like A Series of Unfortunate Events or Wes Anderson movies (Rushmore, The Royal Tenenbaums), I think it would appeal to your sense of humor. Also if A Room with a View makes you laugh out loud. I can’t believe I’d never come across it before. For more of my thriftage, click here. I lucked out on a recent thrifting trip. I’d been looking for awhile for something cool to add to the hall art gallery. Our apartment has a long, long, bowling-alley-like hallway that is just begging for more artwork. Since it’s a hall, you can’t help but stand fairly near the walls, so it’s a good place for groups of smaller pieces that need a more intimate setting. I found the birds and flowers at thrift shop #1. I love the way the black backgrounds make the colors pop. Somehow it makes them look more modern to me, too. I’ve considered painting the frames aqua or something like that. What do you think? I found the little house piece at thrift shop #2. There’s just something about it that’s so sweet but not sugary. Actually I don’t know if I’ll ever get to hang them because the kids want two for their own (girl wants birds, boy wants house). I’m stuck on the hallway idea, though, so we’re kind of in a deadlock over it. Here’s a detail on the birds. The handwork is really impressive. 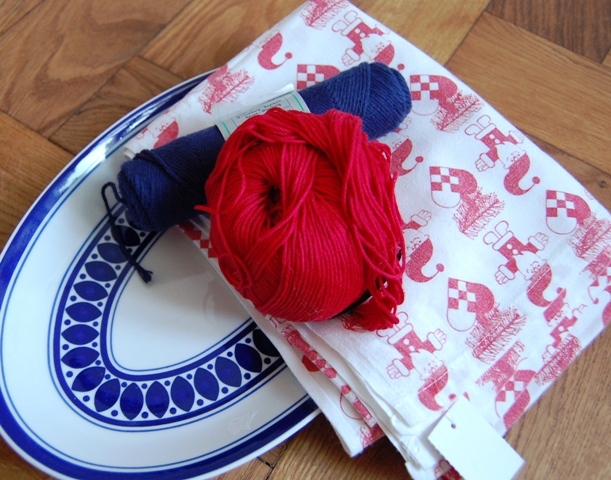 Next up: a platter, a Christmas tablecloth, and two skeins of cotton yarn. I’d been looking for a platter like this for a long time to go with but not match our china (see it here). This one is perfect except I wish it were a little bigger. The yarn is for our little weaver, and the Santa cloth—-well, I just couldn’t resist. It’s kind of a funny size, but I figure we can use it as a runner or as reuseable gift wrap. All this loot for 7 euros 50 cents! I could just about feel the flea market in Copenhagen pulling me across the street. Come look! Cool bargains you won’t find anywhere else! Luckily, the family obliged for a few minutes, while I gasped over the budget prices for vintage Danish ceramics. If you’ve ever been in Copenhagen, you know it’s not really a place for bargain shopping. 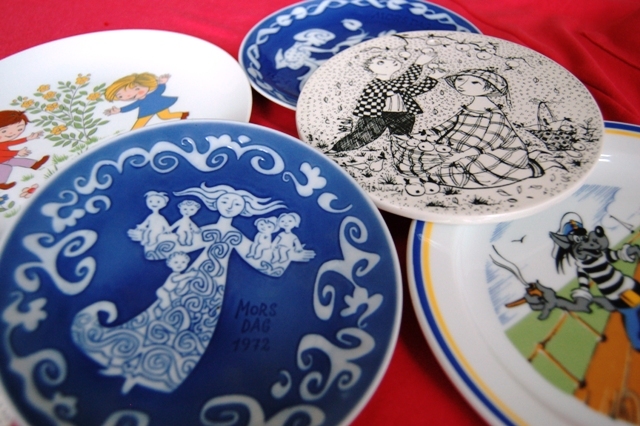 So I was excited to find the blue Mother’s Day and the black/ white Bjørn Wiinblad plates. Just a few euros a piece for perfect souvenirs. I’ve been interested in Bjørn Wiinblad since discovering his work in the pages of Holly Becker’s new book, Decorate. 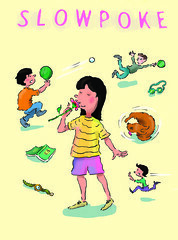 Jonathan Adler, whose home is featured in the book, collects Wiinblad, and I just love the zany, humorous figures. BTW, if you want some totally awesome inspiration for your home, get Holly’s book. I’m thinking about just setting up camp in its pages. The Wiinblad plates are from a 12-month series. I got October and December. The blue Mother’s Day plates, which are about dessert size but designed for hanging, are Royal Copenhagen from the 70’s. They made one of these plates for each year between 1971 and 1982. 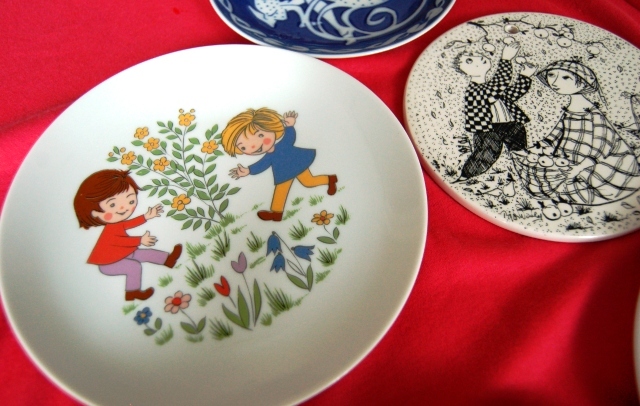 The other two plates (playing children/ animals) I bought at a charity shop here in Hannover. They’re children’s china, something you find a lot more of here because children are expected to use “real” plates, not plastic, as well as real silverware and glass glasses. I just couldn’t resist the one with the children playing. So cute. The animal plate cracks me up because the wolf is smoking a pipe—-such a taboo nowadays, especially on a product for children. This plate was made in East Germany. I’m not too worried about it turning my son into a delinquent. 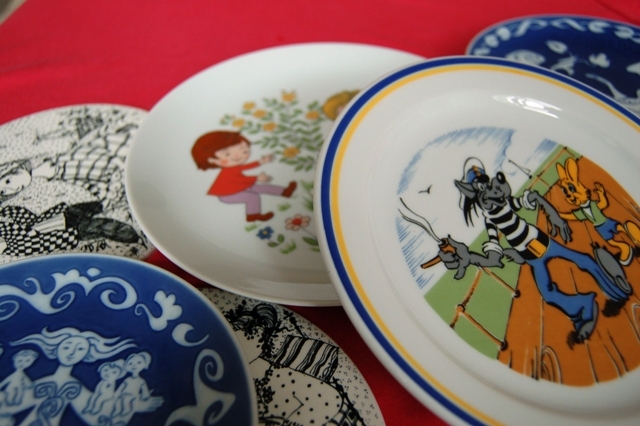 The kids love their plates, and I’ve planned a spot on the wall for the Bjørn Wiinblad ones. 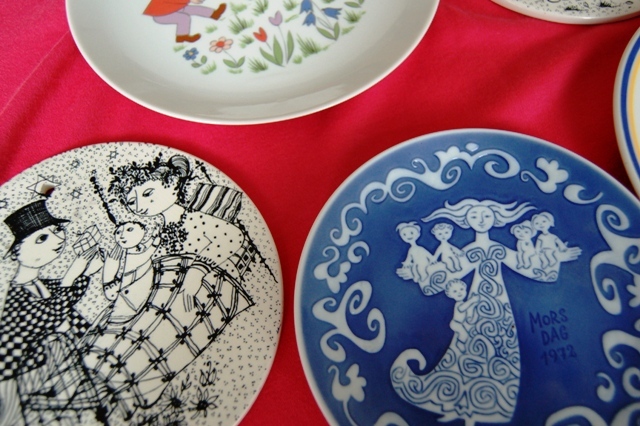 I’m still looking for a home on the wall for the Mother’s Day plates. The SCBWI (Society of Children’s Book Writers and Illustrators) Summer Solstice Scrawl Crawl was a lot of fun. 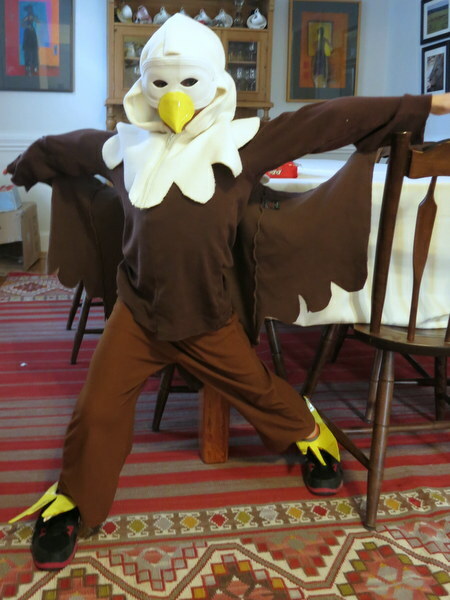 This was an event blog where SCBWI members across Europe sketched and wrote all day on Tuesday and shared their creations on the same blog. Here’s my entry here, but make sure to check out the others. It’s really interesting to see where people were all across the continent. I’ve been missing NPR lately and listening to a bunch of old Fresh Air interviews over the web. Favorites: Jason Schwartzman, Chloe Sevigny, Jason Segel, and Ted Danson. I guess I’m feeling like listening to actors. We’ve been watching HBO’s Bored to Death on DVD (with Schwartzman and Danson). It’s always surprising to hear about an actor’s real life—-like, not the tabloid stuff but the nitty gritty, their insecurities. A lot of those in my list have other legit creative pursuits besides acting, too (writing, fashion, music), which I find fascinating. Hope to see you again soon. School is almost out for us, which means posts may be a bit more scattered, but I’ll be here as much as I can. If you enjoyed this post, you may want to check out this other one about thrifting here in Germany. Every town has its own thrift store scene strengths. I love cruising to see what kinds of clothes, craft fodder, and crazy stuff are available. For the most part, the thrifted clothing here in Hannover is not a strength, though I’ve found some cashmere sweaters just asking to be made into scarves. 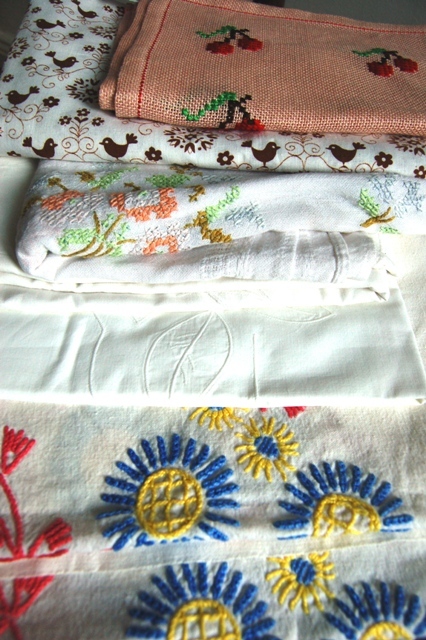 Vintage textiles are a whole other story. There’s a place here called Fairkauf that’s like the department store of thrifting, with four entire floors of stuff. My favorite is the floor of household goods, much of it embroidered tablecloths, runners, hankies, plus all-cotton (mostly white) bed linens. The collection of china and dishes is nothing to sneeze at either. 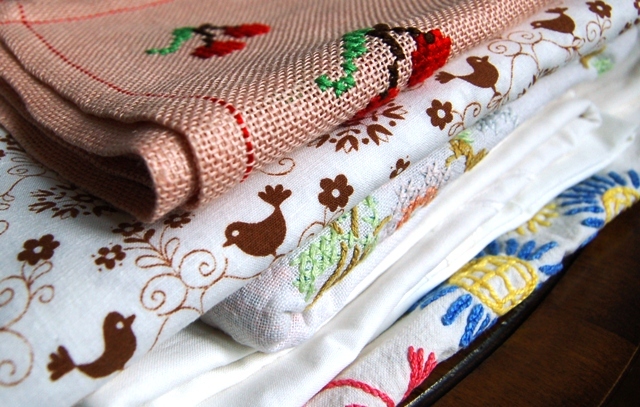 I’ve been dreaming up a new quilt and snapped up some of these things with it in mind. I couldn’t resist the cherry placemats, though (not part of the quilt plan) and the bird fabric (also not for the quilt). It’s just asking to be over-dyed, don’t you think? Below is a “commode” we bought to go next to my work station in the dining room. It holds the printer and scanner (when is someone going to design some more attractive computer equipment?). We were looking at some cheap something at Ikea or whatnot and I thought I could do better. 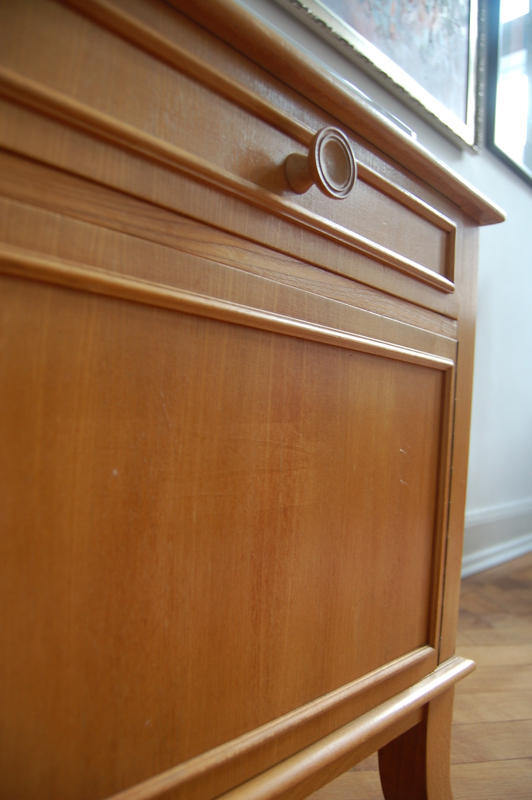 This solid wood, glass-covered, dovetail-drawered baby was only 30 Euros! It also happens to go really well with our dining room furniture. 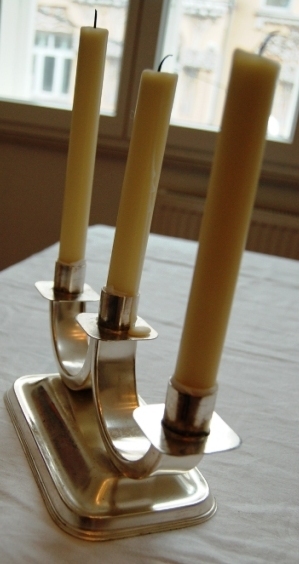 Next up is a candelabra I got at the Flohmarkt (fleamarket) on Saturday. I really like the lines, though I wish it had more candle holders. You need a lot of candles to light up your life in January here. I can’t complain for 5 euros, though! I’ve been wanting to go to the Flohmarkt for a long time. It was pretty cool, lots of interesting stuff, from furniture and antique toys to books and ancient dentistry tools. As you see, I restrained myself. If you, like me, are a thrifter, you must must read this post by Blair Peter of wisecraft about torturing her husband via iphone thrift photos. It’s hysterical and inspiring. 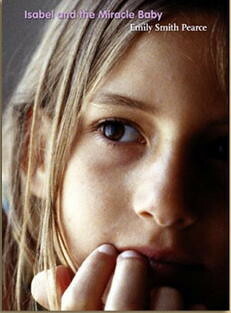 And besides that, she has a great blog with tons of other inspirations. If you enjoyed this post, you might want to check out this one about flea market finds.